Projekte des Vereins > Ausstellung | Kompetenzzentrum Grosssiedlungen e.V. Die Entwicklung der großen Wohnsiedlungen kann in Deutschland als Erfolgsgeschichte bezeichnet werden. In der Ausstellung des Kompetenzzentrums Großsiedlungen, die im Jahr 2013 neu gestaltet wurde, werden die wichtigsten Themen dieser Entwicklung dargestellt und mit beispielhaften aktuellen Projekten dokumentiert. erforderlichen technische Erneuerung, der Beteiligung der Bewohner, des notwendigen Stadtumbaus bis zu den neuen Herausforderungen der europäischen Stadtentwicklungspolitik. Die Ausstellung umfasst 20 Ausstellungsdisplays mit den Maßen 216 x 145 cm. Es handelt sich um ein standortflexibles System, welches einfach aufbaubar und leicht zu transportieren ist. Die gesamte Ausstellung oder ausgewählte Thementafeln wird den Mitgliedern kostenfrei für eigene Veranstaltungen zur Verfügung gestellt. Sie ist auch in einer englischen Version verfügbar. Die wichtigsten Informationen stehen hier zum Download zur Verfügung. Exhibition "Project large housing estates"
Here you can use the English version of our exhibition on the development of large housing estates in Germany"Project large estates" available. The development of large housing estates, especially in the eastern states since the political change can be described as a success story. In the exhibition, the major themes of this development of the modern tradition, the development of rents on the repair of apartments, architectural and technical potential for change, the resident participation, the requirements of the necessary urban redevelopment are shown up to the new challenges of European urban development policy. - We advocate sustainable development of the large rental housing estates built between the 1920s and 1980s in Germany and Europe. - We maintain a cooperation network in order to consolidate and to make the experience acquired available to our German and international partners. - We promote cooperation between Germany and other European countries with the aim of drawing attention to the sustainable development of large housing estates as an important challenge for European Union policy. Revitalisation of inner cities enjoys political attention. Yet sustainable renewal of the large housing estates built between the 1920s and 1980s, in which far more people live than in the inner cities, must not be neglected. They provide quality housing for large sections of the population. This segment of the housing market plays a special role as a social and economic stability factor of large towns and cities. The rental housing estates of the 1920s to 1980s are mostly popular, landscaped housing stocks, which can be developed in diverse sustainable ways. • the possibility of coordinated action of professional landlords on district level. Integrated development concepts represent a binding basis for district development. They are prerequisite for public control of development processes, provide the opportunity to weigh up spatial and sectoral interests, to steer negotiation processes in urban society and to find a new balance between public and private investments. They provide security for investment decisions. Integrated district development therefore encourages all players to jointly direct their attention to the development of their own districts User-friendly housing environment designs and local district-based services covering every aspect of housing and living are just as much a part of this comprehensive renewal concept as the energy optimisation and participation of the residents, in order to support the solidarity and social cohesion of the neighbourhoods in the residential districts. Without accepting political responsibilities, a stable legal framework, administrative capacities and an institutionalised ownership structure in the early 1990s, the successful development in the study area of Frankfurter Allee Süd/Kaskelkiez in Berlin-Lichtenberg would not have been possible. which is now gradually being put into practice. In this way the company is showing that energy modernisation, improving residential amenities and energy management must be organised as one and the respective location conditions, even within a district, must be handled in a differentiated way. This process is also decidedly conflictual. The major programmes initiated in the 1990s to renew and further develop the housing areas built during GDR times using industrial construction methods, and increasingly the many modernisation measures in housing estates of the former West German states too, have contributed to national and European climate protection targets in the area of the large housing estates largely being fulfilled by 2020. At the same time, know-how has been acquired, which is in demand from many foreign partners and institutions. Collaboration in European projects, in which the Centre of Competence is involved, reflects this ins interest. A completely new, sustainable housing quality is created if the energy modernisation is tackled in an integrated approach with other measures. These include accessibility improvement measures as well as floorplan changes to apartments, especially with a view to kitchens and bathrooms that are compatible with the needs of their users. Concepts for multi-generational living in conjunction with diverse service offers, noise reduction measures and upgrading the living environment are implemented. Maintaining the balance between ecological necessity, economic feasibility and social tenability is a major challenge in energy remediation and modernisation. Each energy measure must be economically feasible, both for the tenants and for the landlords. Living must remain affordable – even, and especially, for people on low incomes. The energy requirements in buildings must therefore not be allowed to cause social problems in districts. There are already a large number of examples that show innovative investments to save energy and help protect the environment. These are directly related to the creation of sustainable housing offers for all – from small children, young families through to pensioners. In Cologne the LEG North Rhine-Westphalia has succeeded in transforming the Ford estate built in the 1950s into a modern, energy-efficient housing development. By adding an extra storey to the buildings using prefabricated timber construction methods, around 45 percent more living space has been created. The housing mix was made considerably more differentiated by these additional apartments. The necessary modernisation measures, mainly to the building services, were supplemented with comprehensive reduction in energy consumption, which also includes the use of solar collectors. The 3 litre standard is achieved in the added full storey. The move management was achieved with full letting. Around five million people in Germany live in the large housing estates built between the 1950s and 1980s. There is no doubt about it: the greatest potential for energy saving lies in existing residential buildings. An energy concept as a catalogue of actions for energy and climate protection measures was drawn up for the city of Karlsruhe in 2009. The aim of ‘Volkswohnung GmbH’ is to lower the use of primary energy by 80 percent compared to the non-modernised buildings. The CO2 emissions will be reduced by the same amount. It is planned to achieve this result be incorporating all optimisation options – from state-of-the-art technology to on-going operational optimisation through to user behaviour. The modernisation should achieve significant energy improvements while at the same time, as far as is possible, keeping the "warm" rent (including heating and other ancillary costs) the same for the residents. At the same time as the above measures are implemented, an energy management system will be installed with the help of which the energy flows in the district are recorded. All the building utility substations will be equipped with so-called "smart boxes". In this way the system operation can be monitored and optimised continuously. In the "Elephant" estate in Neu-Ulm, which was built between 1952 and 1955, another way has been tried out for the modernisation of existing buildings. The aim was not to exceed the price of 500 per square metre and also to reduce CO2 emissions at the same time. To enable the grown neighbourhoods to be retained, NUWOG Neu Ulm opted not to install cost-intensive comprehensive façade insulation and instead invested its money in optimising the fuel supply. Tafel 7: Contribution of large housing estates to the “social city"
The main concern of successful urban development and a basic requirement for a properly functioning community is the promotion of good neighbourhoods in the residential district. A large number of measures within the scope of social district development are among other things due to the sustained commitment of the housing companies. Housing cooperatives and companies carry out social tasks, provide accommodation and participate in technical and social infrastructure services. For example, degewo AG in Berlin-Marzahn, as a municipal housing company, provided 15 apartments and a large communal area with kitchen, group room and play area for young parents and their children in a refurbished building. The three and five room (two and four-bedroom) apartments will be assigned to them on reduced rate terms for the duration of the project. Another project is successfully being implemented in Lutherstadt Wittenberg. The two housing companies in the residential district, Wohnungsbaugesellschaft (WIWOG) and Wohnungsbaugenossenschaft (WBG), alongside other social players and committed residents actively tackled development of the district – not only structurally and in energy terms, but above all by setting up a community structure, which thrives on autonomous and voluntary civic commitment. With the opening of a new meeting place the range of facilities provided for pensioners, children and young families have been enhanced significantly and the neighbourhoods have been stabilised. In recent years, WIS Wohnungsbaugesellschaft im Spreewald mbH has completely redesigned the SCHWEITZER ECK residential district, a large housing estate in Lübbenau built in the 1970s. Today the heart of the district is formed by the "Kindertreff" – a former laundry service centre has been converted into a community centre for children – and the original jungle playground, which was built on an unused area of land. The spirit of Albert Schweitzer with his motto "respect for life" has moved in there. Tafel 7 Contribution of large housing estates to the “social city"
Experience in social district development acquired over many years has shown that mere structural renewal of districts in the large housing estates is not sufficient to achieve well-functioning neighbourhoods. A responsible housing company, as an active partner of the public authorities, contributes to the social development of the large housing districts. However, minor, uncoordinated measures are not sufficient to stabilise a district that faces the prospect of being taken over by a negative trend. In this case what is needed is integrative district development, which considers the residential area holistically. This strategy must also be tailored to the respective district. Municipal housing companies especially are predestined for developing such strategies and therefore accepting responsibility for the districts and the town or city. Bremen's most well-known high-rise district Osterholz-Tenever (OTe), home to people from 90 countries, has now – around 40 years after the cornerstone was laid – developed from a basket case into a much-admired model housing district. It is the functioning example for sustainable handling of the problematic type of large estates that were created on the outskirts of many German large towns and cities in the 1960s and 1970s. ‘OTe’ is now an attractive residential area with new qualities. The result is explicable: it is preceded by ten years of joint work with impressive commitment, making sacrifices on one side and enormous financial costs on the other. Bremen, the residents and GEWOBA Aktiengesellschaft Wohnen und Bauen played a large role. Another example shows how created façade design with young people from the district became part of a comprehensive enhancement strategy for the housing area in Berlin-Neukölln. STADT UND LAND Wohnbauten-Gesellschaft, in cooperation with an employment agency, created training placements. The project built bridges: on the one hand between older and younger people and on the other between the German population that had been living there for a long time and immigrants' households. Stabilisation and further development of the large housing estates can only be successful if all stakeholders interact. These are the residents, the planning experts involved, the tradespeople, owners and investors, the employees in the local government administration and those with political mandates. Through information and continuous cooperation, a common understanding is growing of the steps necessary for housing estate development. The "Wohntheke" project in the Berlin-Hellersdorf housing district is exemplary for this. Since 2000, eight housing companies have been consolidating their means and capacities in order to increase the attractiveness of this part of the city through joint location marketing and support for existing initiatives. Even in times of large numbers of vacant apartments, they have succeeded in pursuing goals jointly in a trusting and equal cooperation. The interaction has improved the way that other people perceive the second largest housing conglomeration in Germany, has contributed to a harmonious appearance in the living environment as well as well as the building stocks and coordinated cooperation of the housing industry with all kinds of different stakeholders and players involved in community work. The project received the "Social City Prize" 2012 in a nationwide competition. The social concept and urban planning structure of housing developments during the modern age (1910s to 1930s) had a significant influence on European cities in the 20th century. The housing estates planned and built during the time of the Weimar Republic are considered to be an exemplary new beginning of socially orientated rental housing. The renewal of the housing estates, some of which are protected as built heritage or, as in Berlin, are part of the World Cultural Heritage, the question arises as to how modern housing standards and the needs of energy modernisation can be made compatible with retaining the appearance and urban planning structure – and at the same time for acceptable costs and in agreement with the residents. The examples show a selected bandwidth of possible procedures in completely different types of estates in typological terms. In view of the current situation on the international finance and property markets, the approach of the 1920s, of setting up a high-quality and comprehensive rental housing structure would seem very sustainable and forward-looking. The rental housing estates of the 1950s and 1960s were the response to the housing shortage following the disaster that was World War II. In most cases landscaped housing areas were built following the model of a decentralised, sprawled city landscape, some of which provide potential for redensification, without causing unbearable densities. Renewal of the large structures built in the late 1960s that adhere to the model of "urbanity through density". Where possible, the modernisation is carried out on inhabited housing. This requires sensitive handling of the existing tenants. Good examples are characterised by different owners cooperating within a district and where necessary supplementing the housing stocks with new buildings. The examples described show different approaches to solutions. In the 1970s planners and developers aimed to achieve more compact and urban forms of housing. Following the model of "urbanity through density", especially in the former West German states, new large building ensembles resulted. In the former East German states, the estates built in the 1970s and 1980s according to a concept of complex housing development were intended to solve the housing issue as a social problem. The examples show that the renewal of these housing areas achieves a quality standard that measures up to new build projects. Generally modernised while still occupied, in particular, these housing areas are characterised by high energy standards, which represent a strategic advantage on the local housing markets. Differentiated strategies for the modernisation are necessary to achieve districts with diverse designs and well-mixed social structures. Whereas a few years ago, in general high-rise housing blocks were still frequently stigmatised housing industry headaches, the situation has been transformed both in the new, former East German, and the old, former West German, federal states. The exemplary projects presented show how energy modernisation can be combined with new floorplan solutions and service offerings, which are increasingly in demand. The renovated high-rise block, for example, in Lübbenau in the centre of the new town with its well-developed infrastructure, is an attractive place with high recognition factor. The residents view it as an identification-triggering object, a landmark. The housing company structurally altered the existing apartments to create apartment floorplans that were in demand, and integrated communal facilities and service apartments. The point blocks in Ingolstadt were given a differentiated appearance through innovative modernisation measures. In particular, the utility value of the balconies and loggias has been increased by a second façade skin made of sliding, elegantly detailed glass elements. During the course of the complete modernisation, HOWOGE Wohnungsbaugesellschaft converted the twin housing block in Berlin-Lichtenberg into a low energy building and is exemplary throughout Germany. The extensive energy saving measures include: complete renewal of all water pipes, modern façade insulation, installation of thermostatic valves, new PVC windows with double glazing and above all, the installation of a new district heating service connection station with a CHP (combined heating and power) module and controlled apartment ventilation with heat recovery. Once the "boundary block" of the large-panellised city of Hoyerswerda Neustadt, the modernised tower block, the Lausitztower, has become the "anchor" and symbol of the new centre. The architectural emblemism with the new added roof terrace makes the expansive landscape of the Lausitz come alive. The modernisation of 1980s residential buildings to form multi-generation rental blocks in Senftenberg is another example. The installation of a lift in the building is a lasting improvement for the lives of older people. New buildings to supplement existing housing estates is used, especially in growing regions, if parts of the existing housing stocks cannot be feasibly renewed in economic terms and the new buildings offer qualities missing in the existing stocks, for example, accessible housing and sheltered or assisted housing. The housing owners also have the opportunity to offer higher quality living space as an enhancement of the existing stocks. New tenants moving into the area make the resident structure not only more mixed in demographic terms but also socially, which has advantageous effects on the social stability of neighbourhoods and use of the housing-related infrastructure. The most convincing examples are those that achieve a socially compatible mixture of modernised existing buildings and replacement new build, which among other things facilitates housing moves according to tenants' wishes. The replacement new buildings generally have a larger living space than the former stocks, which is not a disadvantage in low density estates. Large housing estates are sustainable if they are diverse, capable of being developed and attractive to all. Living areas in which it is worth living and are attractive for all generations are linked by three different things: Living in neighbourhoods, the quality of generously sized open spaces and the offer of community facilities. Different apartment sizes and types, such as apartments with gardens, residential units suitable for the aged or maisonettes, create a mixed resident’s structure, which can be maintained long-term. There are now several examples that show how large housing states, for example, in Nuremberg and Arnstadt meet the transformed requirements. Renewal of the housing districts, including adjusted infrastructure, enables diverse housing offers for different phases in life and therefore enable residents to remain within the district even if their situation in life changes. The immediate housing environment, the occupancy quality of open spaces and children's play areas, as well as the accommodation of cars and the accessibility of social facilities all have a large influence on whether a district is suitable for all generations. There are places of everyday encounters, which provide the residents with opportunities for interaction and communication. An attractively designed, user-friendly and economically feasible housing environment design, now more than ever before, is becoming an image-forming characteristic of large housing estates, regardless of whether it involves modernisation or new build. Targeted measures to improve the living environment were the joint focus of attention, along modernisation of the apartments and building façades. Identification with the living environment does not happen automatically. Instead it is very dependent on the opportunity of residents and users to participate in the planning and implementation process and therefore to contribute part of themselves and to be able to recognise themselves in the results. The range of solutions is large, as the examples show. The cooperation in European projects, in which Kompetenzzentrum Großsiedlungen e.V. 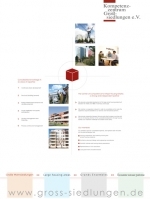 is involved, shows international interest in experience acquired in Germany in the renewal of large housing estates. The EU interregional project "Urb. Energy", which is co-financed by the EU in the Baltic Programme 2007 to 2013, promotes the exchange of knowledge through the joint work of partners from Poland, Estonia, Latvia, Lithuania and Belarus. ’Urb.Energy’ combines energy housing remediation with the drawing up of integrated urban development concepts, the modernisation of energy supply infrastructures and upgrading the living environments. Such concepts were drawn up for selected areas of investigation in each participating country and measures for their implementation were prepared. In Berlin two adjacent city districts in Berlin-Lichtenberg - the Gründerzeit (mid 19th to early 20th century) Kaskelkiez estate and the industrially built Frankfurter Allee Süd district were compared with regard to their total potential of energy modernisation during the past 20 years. A new ‘measurement tool’ developed sets a simplified schema with which an adequately precise overview of the energy situation of a whole urban area can be established. Ecological considerations are increasingly becoming a quality characteristic of modern, sustainable housing designs. • Optimisation of resource use. Recommendations were drawn up on how investors can be motivated to build sustainably. The Center of Competence for Major Housing Estates cooperated regularly as a partner in the project tasks from 2007 to 2013, especially with the representatives of the housing industry from the four EU member states. In 2001, supported by Berlin's Senate, Berlin housing companies decided to set up a centre of expertise ("Center of Competence") for the renewal of large housing estates. Based in the residential district of Berlin-Hellersdorf, with more than 40,000 apartments one of the largest housing estates in Germany, it has developed from a "Berlin seedling" into a platform for the exchange of experiences that enjoys nationwide renown and has more than 100 members from virtually all the federal states. It is used by representatives of housing companies and planning & design consultancies, politicians and administrators, the building industry and science to discuss how rental housing developments built in Germany can be made fit for the future. 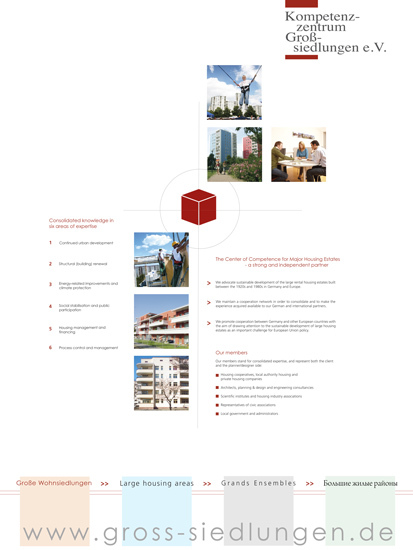 The Center of Competence therefore campaigns to reawaken public attention for housing estates, in which more people live than in the inner cities. The centre has developed into a nationwide network.